The most comprehensive educational event. We offer one to four day tuition pacakages covering crusing distinations, boat systems, and all things related to the cruising lifestyle. Sponsored by American Sailing Association and Beneteau USA. Part of the ASA Small Boat Workshop for New Sailors Series, this hands-on workshop will provide the beginning sailor a comfortable 30-minute American Sailing Association (ASA) classroom overview of sailing basics and what to expect during their on-board lesson before boarding a new ASA/Beneteau First 22 for 90-minutes of on-board instruction. 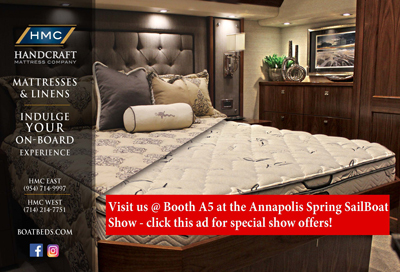 Go to our ticketing site at www.AnnapolisBoatShows.com, select a convenient two-hour block of time (10am – 12pm, 1pm – 3pm or 3pm – 5pm) on either Friday, Saturday or Sunday of the Annapolis Spring Sailboat Show. Purchase your workshop ticket at $35 which includes admission into the show and the On-Board Sailing Workshop. You can print out a two-part ticket: the first being your bar coded ticket into the show and the second being your boarding pass into the workshop. Both parts are able to be scanned on your smartphone if you prefer not to print. Participants will be asked to sign a release of liability, and registration is open to children 8 years and older with an accompanying parent or guardian and a signed waiver. Space is very limited, so early registration is suggested. Time changes and cancellations are possible until April 15, 2015.